As we were planning our wedding in 2016, we were also trying to decide on where to go for our Honeymoon. We had several ideas, but ultimately we wanted our honeymoon destination to be somewhere fun but also relaxing.After considering Hawaii, Fiji, Tahiti and other locations, we ended up deciding on Australia. Australia was a place that both Nick and myself both wanted to visit, so why not travel there for our honeymoon? We started looking at dates and trying to decide when to book our trip down under. We wanted to give ourselves a little breather after our wedding, so we ultimately decided we would spend two weeks in Australia just after Christmas and over New Year's. We had heard wonderful things about the fireworks display in Sydney for New Year's Eve and we knew that would be an incredible once in a lifetime experience. We were quickly becoming self-proclaimed travel experts and we knew we wanted to use hotel points and airline miles to save money on our two week honeymoon trip. To break up the long flight to Australia, we booked flights from Boise, ID to Los Angeles on Christmas Day and would spend two days in the West Hollywood area before flying on to Sydney, Australia. We spent Christmas Morning having brunch at Finch & Fork in Santa Barbara and then enjoying the boardwalk and beach before returning to West Hollywood. It was a bit odd not being at home on Christmas, but we definitely enjoyed spending the day together and exploring the California Coastline. That afternoon we checked into the Andaz West Hollywood and over the course of the next day and a half explored West Hollywood, Santa Monica and the Los Angeles area. The Andaz West Hollywood was a beautiful, modern yet minimalist hotel. In order to save money on what can be expensive flights to Australia, we booked our flight to Sydney and our flight home from Brisbane using Delta SkyMiles on Virgin Australia. One-way flights from Los Angeles to Sydney and from Brisbane to Sydney cost 45,000 miles each way or 90,000 miles round trip. By each using 90,000 miles for our round-trip flight we saved almost $1,800 a person, a terrific use of Skymiles. Virgin Australia is a great way to get to Australia. Virgin Australia operates daily service to Sydney from Los Angeles using a Boeing 777. And since Virgin Australia is a Delta partner, you can earn and redeem Delta SkyMiles on Virgin Australia flights. The plane was beautiful and fairly comfortable for a 14 hour flight. Service on-board was great with dinner, drinks, snacks and breakfast served in all cabins of the aircraft during the flight. The Virgin Australia Boeing 777 was equipped with in-flight entertainment which included dozens of movies. Our flight departed around 11:00 PM on December 27th and we arrived in Sydney just after 6:00 AM on December 29th (yes two days later since we crossed the International Date Line). We both slept for a few hours on the flight and luckily weren't completely exhausted after we arrived in Sydney. After going through customs, we took the Airport Train from the Sydney International Airport to the Circular Quay station near the Sydney Harbour. While hotels can be a bit expensive in Sydney over New Year's Eve, we luckily booked early enough to get a good rate at the centrally located Sydney Harbour Marriott Hotel at Circular Quay. While the hotel was undergoing renovations during our stay, the hotel met all of our expectations with a comfortable room and more importantly a great and convenient location. 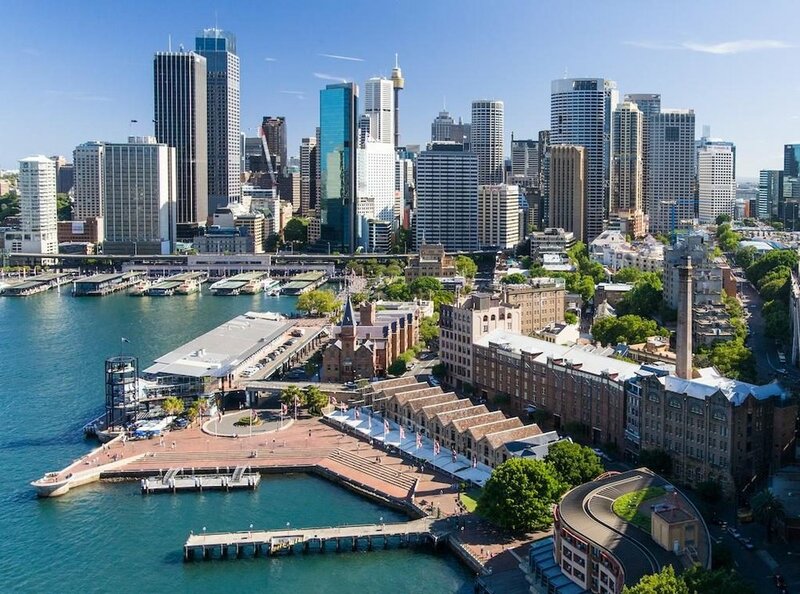 Circular Quay is a great area to stay near since it is the main ferry terminal in Sydney and contains two of the most iconic tourist attractions - the Harbour Bridge and the Opera House. One thing that we loved about Sydney (and for that matter all of Australia) was their public transit system. Over the course of our four days in Sydney, we only used Uber once. We both purchased Sydney's Opal Card and used the ferries, light rail, subway and bus system extensively. We used our first day in Sydney to explore the Central Business District (CBD) and Darling Harbour. We also did that one touristy thing you always find yourself doing on each trip to a big city and we went to the top of the Sydney Tower Eye for a great view of the Sydney skyline and harbour. After grabbing some lunch at Grill'd (a local healthy burger joint), we went back to Circular Quay and took a walking tour of the Opera House and Royal Botanical Gardens. The Opera House tour is an absolute must as you gain a sense of the architecture and design that went into the construction of this magnificent structure and not to mention the history and controversy behind the significant undertaking of building the Sydney Opera House. That evening, despite being a bit tired, we decided to treat ourselves to a nice dinner and ate a delicious steak at The Rockpool Bar & Grill. On our second day (Friday) in Sydney, we decided to relax a bit and spend much of the day in Bondi and Bondi Beach. While there were a few pop-up showers, much of the day was dry and we enjoyed plenty of sunshine while relaxing on the beach. Friday Evening we caught the ferry and went to Watsons Bay and had dinner at the Watsons Bay Beach Club. On New Year's Eve Day (Saturday, December 31st), we booked a wine tour to Hunter Valley. The tour was incredible, not just because of the wine, but it was a great way to get out of the city and actually see Australia. We first stopped at the Walkabout Wildlife Park for morning tea where we got to meet some of Australia's friendliest kangaroos, wallaby's and koalas. Getting to pet kangaroos and koalas was quite an experience, they were actually quite friendly. I am pretty sure Nick would have brought a kangaroo home if he could have! Our next stop was at the Hunter Valley Chocolate Company which makes Belgian style chocolate that incorporates fruits and nuts from Australia! We may have had a few pieces. But the real thing to mention here was a the latte we had made with their homemade chocolate sauce! We then proceeded on to the Hunter Valley where we stopped at three wineries and tried some delicious Australian Wine. Nothing like having a buzz on New Year's Eve Day by 4:00 PM. But it was great. Our tour guide Sam was amazing! He was so friendly, was very knowledgeable about Australia and really tried to get to know each and every person on the tour and made sure everyone was having a great time. We highly recommend booking one of his tours if you visit Sydney! For New Year's Eve, we booked tickets to a private party on the harbour at the Pier 1 Sydney Harbour Hotel. The location of the hotel was incredible for viewing the fireworks as it was located on the water just under the Sydney Harbour Bridge. The tickets included unlimited food and drinks. They were super creative with the food selection, having nearly a dozen food carts/trucks, each with a different and unique type of food. We ate, we drank, we danced, we enjoyed watching the once in a lifetime New Year's Eve fireworks over the Sydney Harbour and of course we kissed at midnight. It was a night neither one of us will ever, ever forget. After not getting back to our hotel until after 1:30 AM and having a busy New Year's Eve Day, we decided to sleep in and recover from a few to many New Year's Eve cocktails. We got up on New Year's Day and walked down to Circular Quay where we caught the ferry to the Taronga Zoo. The Taronga Zoo is a not-for-profit organization and zoo supporting wildlife conservation. The zoo cares for 4,000 animals from over 350 species, many of which are threatened. We spent a good portion of the morning and afternoon exploring the dozens of exhibits at the Taronga Zoo. One of our favorite exhibits was the chimpanzee exhibit that had a fairly young primate "Shiba's Son" who was born in 2014. After spending a good amount of time at the zoo, we spent the rest of our last full day in Sydney at Manly Beach, relaxing on the beach, tanning and people watching. And we capped off the evening have a delicious dinner on the beach at The Pantry Manly. Before leaving Sydney on Monday, January 2nd, we walked over to The Rocks Centre and had an incredible breakfast at The Fine Food Store. We both had one of the best breakfast sandwiches we've ever eaten (which included house-made chili jam). 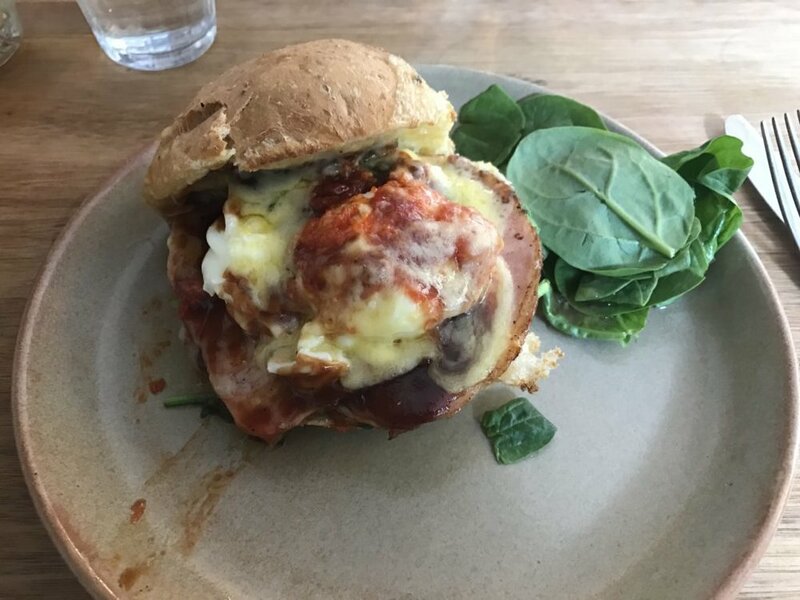 We would fly back to Sydney just to eat that sandwich again (not joking). By early afternoon we hopped on a short two hour flight from Sydney to Melbourne. Navigating the airport and getting through security for a domestic flight in Australia was a breeze. The security is much looser than it is here in the United States. We arrived in Melbourne around 4:00 PM on Monday Afternoon. We had already purchased round-trip tickets on Melbourne's SkyBus which takes you from the airport to the Downtown CBD and makes stops at numerous hotels including ours, the Park Hyatt. We checked into the Park Hyatt Melbourne (which we stayed at for free by using Hyatt Points). Since it was already getting late in the day, we decided to walk to the CBD (Central Business District) of Melbourne and explore a little bit of the city prior to heading out for dinner. We had dinner at 400 Gradi (an Italian restaurant with an Australian twist), which was absolutely delicious. One thing we did discover is that we weren't quite as good with maps in Australia as we were in the United States and we thought we could walk to 400 Gradi. And we did walk, and walk, and walk. Because it was almost four miles from our hotel! But hey, we at least earned our pizza! 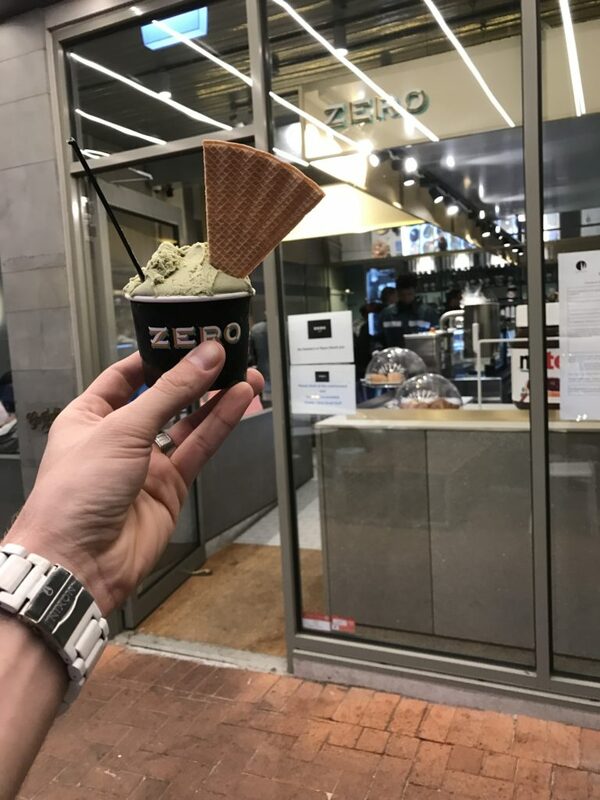 After dinner there just so happened to be a gelato shop Zero next to 400 Gradi and I knew I could quickly get Nick to forget about our four mile walk to dinner by indulging in this creamy sweet treat. On Tuesday, January 3rd, we had breakfast at the hotel and grabbed coffee at The Hardware Societe. We then took time to explore the Queen Victoria Market. The Queen Victoria Market is the largest open air market in the Southern Hemisphere! Nick had been wanting a cowhide rug for our living room and low and behold we were walking through the market when he spotted a vendor who was selling beautiful cowhide rugs. With the conversion rate and Nick's bargaining skills we scored ourselves a new rug that looks fabulous in our living room! And of course we needed one more cup of afternoon coffee, so we stopped by Market Lane Coffee. Their coffee was absolutely incredible (we bought a bag to bring home) and we would highly recommend making sure you to take time to stop here for a latte. One of the neatest things we did while in Melbourne was to pay an evening visit to St. Kilda Beach where a local penguin colony comes into breakwater, climbs up the rocks and back to their nests each night at sunset. There's no specific time when the penguins migrate back to their nests, but typically it happens after sunset. If you aren't on a tight schedule this is very neat experience but you have to be patient. Warning: it can get chilly along the water at night so make sure you bring a jacket! There's not many other places in the world where you can see a wild penguin colony, so if you get a chance, we highly recommend taking time to visit St. Kilda Beach and watch the penguins! The next morning, we had breakfast at the hotel, got coffee at Patricia Coffee Brewers (they only accept cash) and made a quick stop at Short-Stop Doughnuts to get a snack for the road. 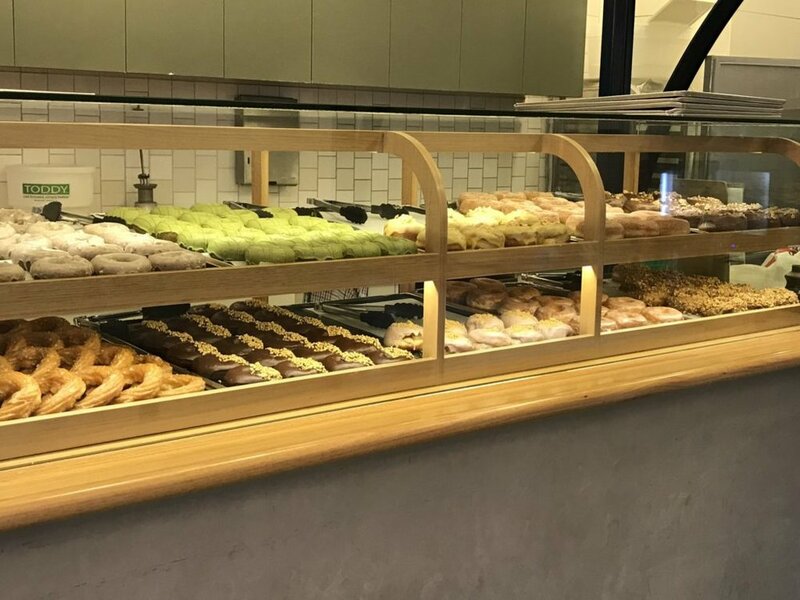 The Australian Honey and Sea Salt Cruller was to die for, possibly the best doughnut we have ever had. We then picked up our rental car and I made Nick drive! Driving in Australia was interesting since they drive on the opposite side of the car and on the opposite side of the road. But Nick did a great job (except when we were in a gas station parking lot). We decided to rent a car so we could brave the traffic and drive Southwest out of Melbourne to the Great Ocean Road. The Great Ocean Road is 151 miles of road along the beautiful and scenic ocean down below. While we didn't drive the entire way, you can also drive out to the Twelve Apostles. This was a highlight of our trip. The views were amazing and seeing this part of Australia was something that we will never forget. After spending much of the day in the car, we were very happy to make it back to Melbourne and Nick couldn't wait to turn in the car and get back to traveling on foot! But before we returned our rental car, we drove back to St. Kilda Beach. We had heard about a Greek Yogurt Cafe (and you know we love Greek yogurt). So we made a quick stop for an afternoon snack at Blu Spoon Greek Yoghurt. It was another great find and somewhere we would definitely recommend, particularly if you enjoy gourmet Greek yogurt or frozen yogurt! Our time in Melbourne quickly came to a close. After grabbing coffee our last morning in Melbourne at Little Bean Blue (which has coffee from Cartel Coffee Roasters), we hopped back on the SkyBus which would take us back to the Melbourne Airport where we would hop on our flight to Brisbane. When we arrived at the Brisbane Airport, we took the AirTrain to the Gold Coast (which is about a 90 minute but very scenic train ride). We decided to spend a couple days on Australia's Gold Coast to enjoy their beautiful beaches. And while the beaches were nice, I would have to say the Gold Coast felt a little bit like Las Vegas, except with a beautiful beach. We stayed at the Hilton Surfers Paradise which was a beautiful hotel (albeit large) located near the beach, restaurants, shopping and nightlife. The Hilton Surfers Paradise upgraded us to a beautiful corner king suite with a balcony. We had a great ocean view from our room and balcony which was very nice. Hilton Surfers Paradise also offers gold and diamond members a free breakfast buffet in their Catch Restaurant. The buffet was very nice with a large assortment of breakfast items. While we did some shopping and explored Surfers Paradise and the Gold Coast, we primarily enjoyed time on the beach and at the pool during our two day stay at the Gold Coast. The water was extremely warm and we enjoyed swimming in the ocean. The beaches were extremely nice, which made it very relaxing to lay out and get some sun. We saved Brisbane for the last two days of our Honeymoon in Australia, thinking that it would probably be our least favorite city we visited in Australia. We were definitely wrong. While Brisbane is smaller than Melbourne and Sydney with just under two million people, we enjoyed the more intimate and compact feel of the Downtown and Central Business District area. We stayed at the beautiful Hilton Brisbane (one of the best Hilton Hotels we've stayed at) which not only was an incredible hotel, it was located right in the middle of the Central Business District, so the location couldn't have been better. After arriving in Brisbane and checking into the hotel, we explored the Queen Street Mall, which is a large open air mall that sits just behind the hotel. Our second stop was the Noosa Chocolate Factory which not only has dozens of different kinds of handmade chocolates (chocolate covered fruits, nuts, chocolate bark) but also serves up coffee drinks including mochas made with their handmade chocolate! It's definitely worth a stop if you visit Brisbane. That night we made dinner reservations at Saké Restaurant & Bar which serves up contemporary Japanese dining with views of the Brisbane River. Needless to say the dinner was excellent. The next day, January 8th, we had breakfast at the hotel, which is a delicious buffet and complimentary for Hilton Gold & Diamond members. After breakfast we decided to relax by the pool for a few hours and soak up some sun. The Hilton Brisbane has a rooftop pool which has beautiful views of the Brisbane skyline. That evening we walked across the Victoria Bridge to the Wheel of Brisbane and explored the Brisbane Water Park (located along the Brisbane River). We had made reservations for dinner at Stokehouse Q located right on the riverfront. Somehow we managed to save the best meal for last as our dinner at Stokehouse Q was possibly one of the best meals either of us have ever had. The next morning we departed for the airport where we hopped on our flight from Brisbane to Los Angeles and just like that, our incredible honeymoon in Australia came to a close. We fell in love with Australia, the people, the culture and the food. We already keep talking about going back (or even moving there for a year or two). But Australia is an incredible place and we highly recommend finding time in your life to visit the land down under. And the sooner the better since the dollar is so strong and the conversion rate continues to be at near record highs! The flight to Australia is extremely long (13-16 hours). Even if you enjoy flying, this flight can be brutal if you can't sleep or get stuck in a bad seat on the plane. Our advice: splurge on your ticket and get a better seat or use miles to fly in business class. You won't tip in Australia. Tipping is not part of the Australia culture. Prices at restaurants, coffee shops, etc. are inclusive of the tip. So put those dollar bills back in your wallet. You'll notice certain words are different in Australia. For example cotton candy is called fairy floss and a shopping cart is a trolley. Elevators are known as Lifts. As we said above, we used Delta SkyMiles to pay for our flights to and from Australia. By each using 90,000 miles for our round-trip flight we saved almost $1,800 a person, a terrific use of Skymiles. We used Hyatt points for our stay at the Park Hyatt in Melbourne. We used Hilton points for our our stay in the Gold Coast at the Hilton Surfers Paradise and points for our stay at the Hilton Brisbane. If you decide to take a trip to Australia and need any advice, definitely let us know! Or if you want to take us with you, we would be okay with that too! Click here to download our Australian Itinerary.